PokerStars Live online media accreditation form is available here. For support or enquiries, please contact press@pokerstarslive.com. PokerStars Live (“we”/ “us”/ “our”) welcomes all representatives from media outlets (“Media Representatives”) and Streamers/Vloggers (“Vloggers”) to its PokerStars Live* events (“Events”) and looks forward to helping with all media requests as may be required. Our goal is to ensure that our Events run smoothly for poker players, the casinos, our staff and all attending Media Representatives. Please make sure that you read through and abide by the following media and Streamer/Vlogger guidelines (“Guidelines”) to assist us with the effective running of the Events. Any breach of these Guidelines may result in the revocation of media accreditation for Media Representatives or of the Streamer Pass for streamers/vloggers either for a particular Event and/or future Events. Media Passes can be provided upon successful application to all Media Representatives, Streamers and Vloggers who are attending our events in a content-generation capacity. If a member of the media is coming to play and vlog, then a Streamer Pass should be requested. If a player is streaming/vlogging, then upon successful application, they will be granted a Streamer Pass. If a member of the media wants to play a specific tournament during their time at a PokerStars sponsored event, they must give up their Media Pass for that time and will lose access to the media room. If a member of the media wants to play a specific event and vlog, they must give up their Media Pass and request a Streamer Pass. Please Note: For some events, media are required to attend solely in a media capacity and cannot play. In this instance, applicants will be informed during the accreditation process. Please note that the submission of an online application for media accreditation and/or Streamer Pass to attend an Event (“Media Pass”) does not automatically guarantee that such application will be approved and/or granted. Each applicant will receive a response email from press@pokerstarslive.com, to confirm whether or not the application for the Media Pass and/or Streamer Pass is successful. Without exception, Media Passes and/or Streamer Passes will only be issued pursuant to written approval from us and we reserve the right to limit the number of Media Passes that may be issued to Media Representatives from any one media outlet. Media Representatives who apply for Media Passes must abide by all applicable statutory requirements that may apply in relation to their attendance at any Event. Statutory requirements will include but not be limited to a minimum age requirement, together with any additional local requirements or restrictions that may apply. Where an application is made for a Media Pass, it must only be used by Media Representatives of a media outlet whose primary objective is to report on activities taking place at an Event. Media Passes will only be issued to employees of and contractors for recognised media outlets, including poker media outlets, mainstream newspapers and magazines, bloggers, licensed broadcasters (television and radio) and national news service organisations. Media Passes will not be issued to non-editorial staff attending Events for marketing purposes, such as but not limited to representatives from public relations firms, marketing/sales/advertising agencies or poker management or business related services. Applications for Media Passes must be made by emailing press@pokerstarslive.com, ensuring that all relevant fields of the application form are completed, including but not limited to name, organisation, full contact details and plans for media coverage. It is advised that applications for Media Passes should be submitted well in advance and no travel arrangements should be made to attend an Event until written notification is received from us confirming that the Media Pass application has been approved. No Media Representative will be granted entry to an Event without a Media Pass. First-time applicants from any media outlet as well as all freelance journalists must provide us with such documentation as we may reasonably request in order for us to assess the application as well as to confirm that the applicant is from a recognised media outlet. The number of Media Passes that can be granted to any one media outlet will vary depending on the Event and/or the venue where the Event will be held. This is typically a result of venue capacity and we reserve the right to appropriately manage the facilities made available to media outlets. All requests for interviews with sponsored players should be pre-arranged through press@pokerstarslive.com wherever possible. For any interviews with players while at the Event, you will need to contact one of our PR representatives while at the Event venue and/or via email at press@pokerstarslive.com, who will arrange a suitable time and place for the interview to take place. Media Passes are non-transferable. If, for any reason, you need to change personnel before or during an event, please contact press@pokerstarslive.com as soon as possible. In order to record during a PokerStars Event, Streamers/Vloggers must have a designated Streamer Pass. To receive a Streamer Pass, applications must be made here. Anyone applying for a Streamer Pass must adhere to the full Media and Streamer/Vlogger guidelines. Specific filming requirements can be found in Section 5 ‘Video’. All team members/assistants with the Streamer/Vlogger must each apply for a Streamer Pass and have their Streamer Pass present at all times during filming. The Media Pass/Streamer Pass should be worn prominently at all times and be presented for inspection as and when requested by any of our authorised representatives and/or the Event venue. Media Representatives with Media Passes are prohibited from playing in the main event of any PokerStars Live tour stop or live room. In addition, Media Representatives are not permitted to report on any side event in which he/she has played or intends to play while at an Event. If a Media Representative would like to vlog the tournament they are playing in, they must remove their Media Pass and apply for a Streamer Pass (refer to Section 2 ‘Streamer Pass’). It is prohibited for a Media Representative with a Media Pass to have any stake (financial or otherwise) in the outcome of an Event. This includes purchasing shares or equity in any individual player or sponsored team in any way. This prohibition includes any type of fantasy game that has a financial consideration. The only language that may be spoken in the tournament area for an Event is the official tournament language (s) for that particular Event. Respecting the emotional engagement of players by not visibly or audibly “celebrating” if a particular player wins a pot. In the tournament area for the Events, it is essential that the Tournament Director, floor staff, PokerStars Live staff, PokerStars Blog staff, PokerStars-affiliated film crew and casino staff are able to carry out their respective duties unhindered at all times. Please follow all directions of all tournament staff or our representatives. All Media Representatives and Streamers/Vloggers should leave the tournament area when the floor staff and/or players are bagging chips. If asked to leave a particular area by one of our authorised representatives and/or a representative of the Event venue, Media Representatives and Streamers/Vloggers should do so politely. Anybody who refuses to follow instructions risks losing their Media Pass/Streamer Pass for the entire Event and for possible future Events. During the later stages of a tournament, when a small number of tables remain, Media Representatives and Streamers/Vloggers will be asked to leave the cordoned-off area around the tables. When the playing area is cleared, tournament staff will endeavour to provide a separate, cordoned-off media area but this is not guaranteed. Media and Streamers/Vloggers are asked to keep a reasonable distance away from the TV crew. This is a safety precaution as the equipment used is heavy and could cause injury. If a particular shot is needed, Media Representatives and Streamers/Vloggers should talk to the producer or floor manager and let them know what they require. They can often move a cameraman/sound engineer out of the way. At all Events there will be designated photographers taking photos of the tournaments. Images taken from the approved photographers are available for use by emailing press@pokerstarslive.com. In some venues, photography is not allowed anywhere outside the tournament area; anyone found infringing casino regulations in this regard will have their Media Pass/Streamer Pass taken away for the entire Event and possible future Events. Photographers must respect the privacy of casino clients who are not participating directly in the Event. Flash photography is prohibited during tournament play and on the feature table. In some venues filming is not allowed anywhere outside the tournament area and any Media Representative or Streamer/Vlogger found infringing upon casino regulations will have their Media Pass/Streamer Pass revoked. Videographers need to respect the privacy of casino clients who are not participating directly in the Event. Filming for future broadcast us allowed in the general tournament room. Focusing on specific tables, zooming in on specific hands, or filming the cash registrations area, security, cash game area in the main casino building or casino game areas, is not permitted. Filming while at the poker table is strictly prohibited. 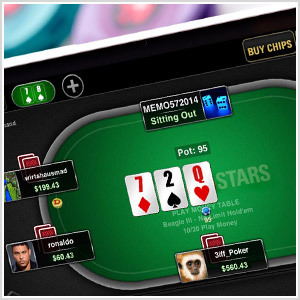 Live-streaming any active PokerStars Live tournament table is strictly prohibited. Media Representatives and Streamers/Vloggers may live stream in the general tournament area but ONLY with prior written permission by emailing press@pokerstarslive.com. Any Media Representative or Streamers/Vloggers wishing to use live streaming services must seek written permission - in advance and include full details of such intentions or plans when applying for online media accreditation/Streamer Pass in order to receive a Media Pass/Streamer Pass. Filming of the TV table is strictly prohibited during tournament action, other than by the designated PokerStars Live film crew. Media Representatives and Streamers/Vloggers can request to film the TV table while poker play is not taking place by emailing press@pokerstarslive.com with the specific requirements. Media Representative and Streamers/Vloggers should be respectful of the other players. Recording should not make other players uncomfortable in any way. If any player asks for you to not record them, you must stop recording. Do not put cameras or other equipment into people’s faces (facing them or not) unless they agree. Do not hold recording equipment over the table or over other players. Do not focus cameras on other players unless they specifically request to be part of your recording. Cameras and equipment should not be obtrusively placed at or on the table at any time. We will endeavour to provide media facilities, including a press room equipped with wireless or cable internet access at the Events (“Press Room”). Only Media Representatives with Media Passes will be allowed access to the Press Room and/or any other media facilities. If a Press Room is at full capacity, it may become necessary to restrict access to the Press Room and/or any other media facilities. Media Representatives should respect the fact that shared Press Room facilities are for work purposes only. Please do not use bandwidth for any non-essential or non-work activities. For security purposes and due to other considerations, Media Representatives – are asked not to invite players, colleagues or friends into the Press Room. No responsibility will be taken for any personal items or work equipment left in the Press Room and/or tournament area. Please respect any venue regulations regarding access e.g. casino dress codes, food/drink bans while attending any Event. We require that all Media Representatives and Streamers/Vloggers provide the relevant Event sponsor (as we may request) prominent recognition and/or mentions in their coverage and streams/vlogs of the Event. This requires Media Representatives to clearly credit the Event sponsor in the first mention of the Event, in the case of written articles, or in the case of video coverage for Streamers/Vloggers, this would include prominently mentioning the sponsor during the video. This also includes any reports that use information, photos or videos supplied by PokerStars Live, even if journalists are not accredited and/or are not attending the Event. For all reporting of Events, Media Representatives must adhere to and abide by trademark policies with regards to any and all use of the Event sponsor logo. Contact press@pokerstarslive.com for more details. When an Event is being broadcast live on a delay (cards-up**), Media Representatives and Streamers/Vloggers must follow the delay with their live reporting of the Event. This is to keep to the same schedule as broadcasters receiving and transmitting the feed. This delay applies to all/any live reporting, blogs, social media posts and live streaming platforms. All Media Representatives and Streamers/Vloggers, regardless of status, are subject to the PokerStars Live Event Security Policy when attending Events. The details of the policy can be found here. Any Media Representative or Streamer/Vlogger that fails to comply with any provision of these Guidelines or fails to comply with a request from a member of our staff or Event venue representative will have their Media Pass and/or Streamer Pass revoked for the duration of the Event and risks being banned from future Events. Should you have any queries with regards to the media accreditation or media/Streamer/Vlogger requirements, please email press@pokerstarslive.com. *PokerStars Live is the brand name for the live poker events, such as but not limited to the “PokerStars European Tour”. **Delayed broadcast with players’ hole cards displayed on screen.